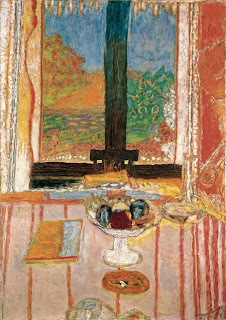 The Pierre Bonnard painting, Table in Front of the Window, in the previous post must have left more of an impression than I thought. It influenced something I'm calling Forsythia Through The Office Window.... on a rainy day. So pretty. Forsythias bloom just at the right time and are just the right color to make one smile. I wonder if that is why a smiley is the color of a Forsythia?